← Lakota Grandmothers Rising! Mitaku Oyasin! 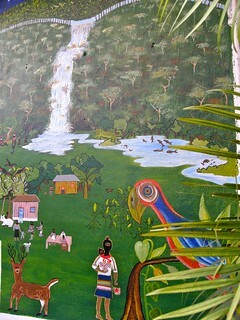 Where does one start a story of Chiapas and the Zapatistas? One useful starting point might be during the Spanish conquest of the lands that comprised the narrow isthmus between North and South America. At the time, the Chiapas lowlands were considered to be ‘the breadbasket’ to the indigenous of the region; I’ve read that over 125 different heirloom varieties of maize still exist. But as the Spanish enlarged their appropriated holdings and began farming large coffee and cotton plantations, and created vast cattle ranches, the indigenous Mayans were pushed into the rocky, thin-soiled highlands to eke out an agricultural subsistence. When those lands proved inadequate to their needs, some Mayans cleared the jungled hills to the east; some poor Spanish-speaking residents fleeing poverty in the south joined them. As ever, when such an underclass is created by ‘the Victors’ of colonization, so does it evolve that a pernicious form of racism and bigotry is also created. That condition still exists today. Until the early part of the 20th Century, the land outside the native villages in Mexico was the property of the oligarch class. In what now seems a remarkable feat, during the 1930s, President Lazaro Cárdenas created the ejidos system in which millions of hectares of land were distributed to Mexican peasants. The land could not be sold, just passed down through the generations. Cárdenas also nationalized the Mexican petroleum industry, which goes by the name Pemex. During his tenure, he also helped to create a national labor union. Over the decades, the ejido system was corrupted, and many of the 28,000 parcels of land once again came under the control of the feudal lords of Mexico, often Europeans. Emilio Zapata, revolutionary hero to the Mexican peasants, often cried, ‘The land belongs to the people who work it’. It became the anthem of those still infused with the spirit of the ejido concept as they their holdings fall prey to the greedy and powerful. His murder by Mexican generals under President Caranza in 1919 in an act of betrayal as he sought a truce, reified his battle cry among the peasants, as did the sense of righteous power he willed to the generations who came after him. That fervor would lie in quiet dormancy for some 40 or 50 years, waiting to be sparked anew. Poverty and disease among the Mayans in Chiapas and neighboring Oaxaca were rampant. Rumblings of dissent began to emanate from the highlands, rolling among the people. The recently created Ejército Zapatista de Liberación Nacional (EZLN), or Zapatista movement, began to accrue more and more members. Adding fuel to the Indigenous fire, in an arguably stolen election in the 1988, Carlos Salinas was elected President. Under his corrupt rule, privatization of the ejido lands was legalized in 1992; forests, land and water were gobbled up by the feudalist class. On the first of January, 1993, Zapatista communities approved a military offensive by the EZLN. Guerillas seized control of the colonial city of San Cristóbal de las Casas and 5 towns in the surrounding Chiapas highlands. On Jan.12, a cease-fire was called. The truce was arranged by the well-known Liberation Theologist Samuel Ruiz. February: Peace talks began in February; the government peace proposal was rejected by the Zapatista communities. In August, after holding the National Democratic Convention attended by 6000 Mayans and their comrades, the Zapatistas declared autonomy for 38 indigenous municipalities. They have created cooperative agricultural systems, clinics, schools, and actual democratic institutions for themselves. Their point has long been that they simply want autonomous rule of their districts in which all people make the decisions in a true participatory ‘bottom up’ rule. Not long afterward, a Feb. 1995 report from the Chase-Manhattan Bank surfaced, urging the Mexican government to ‘eliminate the Zapatistas’; their brand of state destabilization is bad for business and the value of a peso, you know. A month later, the army mounted a massive invasion of Zapatista territory, implementing a strategy of low-intensity warfare (civilian-targeted warfare). The army displaced 20,000 campesinos, and occupied much of Chiapas. The following years of rule by Zedillo and the PRI were hellish for the self-rule municipalities; Zedillo deported human rights workers by the droves. There were brief respites of oppression under Vincente Fox’s rule, including dismantling some of the military bases and checkpoints, freeing some political prisoners. When the Senate passed a weak-tea version of the San Andres Accords in April of 2011, the Zapatistas went home, and entered The Silence once again. Allow me to neglect the intervening years of oppression and misery, and come to the winter solstice of 2012, when the Zapatistas walked out of the misty jungle highlands in silence, thousands of masked men, women and children. As the Maya calendar ends, a new cycle of struggle begins with thousands of Zapatistas peacefully and silently occupying town squares across Chiapas. The Zapatistas are back! Flowing like the water of the river that beats the sword. And while some were anticipating the Christmas holidays, some others the end of the Maya calendar, and others still the new Communiqué from the Comandancia General of the EZLN that was announced back in November, the main cities of Chiapas woke up today with memories of 1994. New Age freaks around the world may have been gearing up for the end of the world, but it appears that some Mayas had a very different opinion on the matter. They preferred to send us another message: that of the new world they have been building in silence for two decades now. Obama threw his weight behind Peña Nieto’s reforms, referring obliquely to the education reform that has provoked thousands of teachers to take to the streets in defense of their jobs and the public education system. He also mentioned the crown jewel for U.S. oil companies and Pentagon planners—the privatization of the national oil company PEMEX. U.S. oil companies have long been chomping at the bit to share success in Mexican oil resources. For decades, Mexican governments have run the state-owned enterprise into the ground in anticipation of making the case for greater privatization, taxing away funds for even basic reinvestment and maintenance. Peña Nieto denies he’s promoting “privatization” but believes he can pass legislation to greatly increase areas where private investment is allowed. It’s a detailed report, but read it if you have time. This concerns Mexico, our close neighbor to the south; a pretty big deal altogether. Did Nieto speak to Obomba about crushing the Zapatistas, or does he know…he doesn’t really need to (as in: if the CIA is already involved)? If you’d like to read Subcomandante Marcos’s post-Walk in Silence communiqués, I will dig them up for you. Does all of this remind you of other US ‘non-intervention’ across the globe? It’s just more of the same: Neoliberalism on the March, Military ‘Solutions’ to Civil Rights and Justice Problems. Put down those who resist, and make way for Bidness. Privatize Everything, Monetize Every Resource, and Send in the Clowns. They really seem to believe that they can keep starving, oppressing, and killing vast numbers of us without reprisal, even of the non-violent sort. But at least we can’t be faulted for having a bit of fun imagining more dire consequences, can we? This entry was posted in empire and war crimes, indigenous global activism. Bookmark the permalink. I don’t know anything about this, other than what I’ve read here, so I won’t say more than thanks very much. that’s plenty, mafr. and welcome. Would it be possible to have an ongoing open thread, where I can just stick a tune, or some such thing? For instance, I was looking at a site called savingcountrymusic, and they introduced me to Sturgill Simpson, he’s a new guy who sings like an old country guy, I could put it in the ongoing thread. sure; we can just stick the More break at the top, then enter videos at will, and it won’t take up much space at all. would it be yours, ours, anyone’s, and shall i set it up, or would you like to? i’m easy. we can’t easily keep ratcheting it up on top of newer posts, but if anyone comments, then the open thread will show up in the recent comments list. so after entering a new video, we might want to comment that we had. or you had. should it be called something like: ‘new or favorite music open thread’? I don’t mean just music, anything, a link to a site or an article, or a random thought…. for instance I’ve been reading and listening to some things about China, and realized that I am ignorant. about that. so I could put a few links up that I have found. how about something like this? we can tweak it pretty much at will. yes, i’d like to know more about china, as well, mafr.